User Name: (min 6 characters, case sensitive) Leave blank if you want to use your email as your User Name. Additional features of the CarePaths Service may be described on the Website. If you accept these Terms, you represent that you have the capacity to be bound by them. your rights as a consumer. We highly recommend that users read any amendments carefully. We have the right to assume that you have accepted the change to the terms and conditions, unless you notify us to the contrary no later than thirty (30) days after the amendment comes into force that you desire to cancel the contract or deregister or unsubscribe from access to the CarePaths Service. We will post the most current Terms of Service on the Site. Your use of the CarePaths Service is subject to the most current Terms as posted on the Site at such time. It is your responsibility to visit this page to find any updates that may have been made to the Terms. To use the features of the Services, you must register an account with the Service. When you register as a Clinician or Practice Group, we may ask for your first and last name, telephone number, license number, state(s) in which you are licensed, profession, email address, credit card information, and any other information required to deliver the Service to you, and you will be required to create a password. When you complete the registration process, you are subject to the Payment terms as set forth on our Pricing Page. Use by adult consumers for their personal mental health purposes is free of charge. This site is intended for licensed behavioral Clinicians or Practice Groups and adult consumers only. By registering as a Clinician or Practice Group you confirm that you are licensed to practice psychotherapy or psychiatry in the state where you practice. If it is determined that you do not hold an active license in a state, your account will be canceled. We reserve the right to cancel your account for this reason or for any reason. If your license is ever restricted or revoked, you must inform us immediately. You agree to keep all contact information, including the status of your license, your practice, and your email address, updated and accurate. If you have registered as a Clinician or Practice Group with CarePaths, you are responsible for maintaining the confidentiality of login information and for restricting access to your computer, and you agree to accept responsibility for all activities that occur under your account regardless of who actually uses your account name or password. Users use of any information or materials on the Sites is entirely at your own risk, for which CarePaths shall not be liable. No Harassment of CarePaths Employees or Agents. You will not harass, annoy, intimidate or threaten any CarePaths employees or agents engaged in providing any portion of the Services to you. No Copying or Harvesting of Site Content. No portion of this Site, including copyrighted text may be reproduced, duplicated, copied, sold, resold, visited, or otherwise exploited for any commercial purpose. You may not make any commercial use of data mining, robots, or similar data gathering and extraction tools. Geographic Limitations. You will only use the Services in a manner consistent with this Agreement and any and all applicable local, state, provincial, territorial, federal, national and international laws and regulations. Registration for, and use of, the Services are void where prohibited. Information Submitted. You are solely responsible for, and assume all liability regarding the clinical use of the outcomes information created on this site. You agree that you are solely responsible for any breach of your obligations under the Terms and for the consequences of any such breach. We have no responsibility to you or to any third party for such breaches or the consequences of such breaches (including losses or damage that You or CarePaths, Inc. may incur). The CarePaths Service may link to third-party websites or resources. Such links are provided as a convenience to you only and do not imply an endorsement, warranty or guarantee by us of any such linked site or the company it purports to represent. We do not assume any responsibility or liability for their availability, accuracy, the related content, products or services. You are solely responsible for use of any such websites or resources and compliance with their policies. Should you elect to enter into a binding contract with any such website, you agree to hold us harmless and hereby release us from any liability whatsoever, whether arising out of contract, tort or otherwise, for any liability, claim, injury, loss or damage suffered as a result of your actions or the actions of any user associated with your account, offering to accept or having accepted any products or services that are available from those sites. You acknowledge and understand that, except for Protected Content (as defined below), we own all right, title and interest in: (a) the CarePaths Service; data files; and (b) all e-mails; computer software; advertisements; sponsored content, trade-marks, copywritten material and other intellectual property rights; (all such information, individually and collectively, being the “CarePaths Content”), which you may have access to when using the CarePaths Service, are owned either by us or the entity from which such CarePaths Content originated. The CarePaths Content is protected by our intellectual property rights or the rights of the entities who have provided to the Company such CarePaths Content. Except as set forth in the Agreement, all rights not expressly granted to you are reserved. You agree not to decipher, decompile, disassemble, reconstruct, translate, reverse engineer, or discover any of the intellectual property or ideas, algorithms, file formats, programming, or interoperability interfaces underlying the CarePaths Service. You may not modify, rent, lease, loan, sell, distribute or create any derivative products or services (or parts of services products or services) based on CarePaths Content that you do not own or to which you have rights, or to create derivative works based on the CarePaths Service. You may not infringe upon our intellectual property and the intellectual property of any other entities that provide the CarePaths Content; or adapt, reproduce, publish or distribute copies of any information or material found on the CarePaths Service in any form (including by e-mail or other electronic means), without our prior written consent. We grant you a non-exclusive, non-transferable, revocable, limited license to use the CarePaths Service in accordance with these Terms. This license may be revoked upon breach of these Terms by you and shall automatically be revoked upon termination or expiration of this Agreement. The Company may, now or in the future, own rights to trade-marks, trade names, services marks, logos, domain names and other distinctive brand features which we use in connection with the operation of the CarePaths Service (each such feature being a “Brand Right” and collectively being the “Brand Rights”). We do not grant you any right or license to use any Brand Right other than as expressly set out in these Terms and in other licenses between you and us. Any personal health information, or any information which may be governed by HIPAA, is the sole and absolute property of you (“Protected Content”). 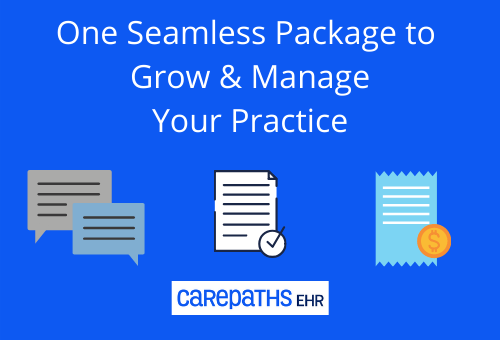 CarePaths only facilitates Protected Content as an agent, as defined in HIPAA, of you in order to provide the CarePaths Services. CarePaths will not transmit Protected Content to any third-parties. Any employee or contractor of CarePaths who may come into contact with Protected Health Information shall sign a confidentiality agreement setting forth the absolute confidentiality required when handling Protected Health Information. You may access, download or print a copy of Subscriber Content provided to the CarePaths Service for your personal use or, if you are a company, your company's internal use only. Any other distribution, reprint or electronic reproduction of Subscriber Content or CarePaths Content from the CarePaths Service in whole or in part is expressly prohibited without our prior written consent. You may access, download or print a copy of Protected Content provided to the CarePaths Service: (i) for your personal use; (ii) if you are a company, for your company;s internal use only; and (iii) in accordance with applicable laws, including HIPAA. Any other distribution, reprint or electronic reproduction of Protected Health Information from the CarePaths Service in whole or in part is expressly prohibited without our prior written consent. When you provide information to us you represent and warrant that you have the unfettered right to do so, you are doing so in a HIPAA compliant manner, you have no reason to believe you are violating the rights of any person or any contract or other obligation to which you are subject, and you are not subjecting us to any expense or liability. The CarePaths Service is provided “as-is” without warranties of any kind, either expressed or implied. You acknowledge, agree and understand that you use the CarePaths Service at your own risk. We will have no responsibility for any harm to your computer system, loss or corruption of data, or other harm that results from your access to or use of the CarePaths Service. The CarePaths Service may be temporarily unavailable from time to time for maintenance or other reasons. We assume no responsibility for any error, inaccuracy, omission, interruption, deletion, defect, delay in operation or transmission, communications line failure, theft or destruction or unauthorized access to, or alteration of, any communications between you and the CarePaths Service. We accept no responsibility for the accuracy of any CarePaths Content provided by, or created using, the CarePaths Service except as otherwise set out in these Terms. You are responsible for ensuring that the information you have entered into our system is accurate, reliable, complete and permitted to be disclosed within HIPAA requirements. Except in the manner provided for in these Terms, we and any other entity providing CarePaths Content disclaim, and expressly do not provide any direct or indirect, express or implied representation or warranty as to title and non-infringement of intellectual property in relation to the CarePaths Service. any Content relating to the use of the Service. You agree that you will defend, indemnify and hold harmless us and our officers, directors, shareholders, employees, agents and representatives, from and against any and all damages, judgments, liability, costs and expenses (including without limitation any reasonable legal fees), in whole or in part arising out of or attributable to: (a) generally: your breach of these Terms; your access to and/or use of the CarePaths Service; and any loss of, or damage to, any property, or injury to, or death of, any person (including You) caused by Your access to and/or use of the CarePaths Service; and (b) specifically, your breach of the intellectual property rights of any third party these Terms. You agree that you will be solely responsible for all activities that occur under your account, whether you are aware of them or not. You agree to hold us harmless and release us from any loss or liability whatsoever that you may incur as a result of someone other than you using your password or account, either with or without your knowledge. You agree to indemnify us for any damages, third party claims or liabilities whatsoever that we may incur as a result of activities that occur on or through your account, whether or not you were directly or personally responsible. These Terms are effective on the date that you register for the Service until our relationship with you is terminated. You may terminate your relationship with us by canceling your account at any time, using the Website interface. if providing the CarePaths Service is no longer commercially viable for us. we may delete all data and information associated with your account (except for information covered by the Patient Health Information Transfer and Release Form). By visiting the Site or using the CarePaths Service, you agree that the laws of the state Florida. With respect to any disputes or claims, you agree not to commence or prosecute any action in connection therewith other than in the state of Florida. You agree to pay reasonable attorneys' fees and court costs incurred by us to collect any unpaid amounts owed by you. You agree that we are not liable for a delay or failure in performance of the CarePaths Service or the provisions of these Terms caused by reason of any occurrence of unforeseen events beyond our reasonable control, including but not limited to, acts of God, natural disasters, power failures, server failures, third party service provider failures or service interruptions, embargo, labour disputes, lockouts and strikes, riots, war, floods, insurrections, legislative changes, and governmental actions. If any portion of these Terms is deemed unlawful, void or unenforceable by any arbitrator or court of competent jurisdiction, these Terms as a whole shall not be deemed unlawful, void or unenforceable, but only that portion of these Terms that is unlawful, void or unenforceable shall be stricken from these Terms. The insertions of headings are for convenient reference only and are not to affect the interpretation of these Terms. You may not, without our prior written consent, assign the Agreement, in whole or in part, either voluntarily or by operation of law, and any attempt to do so will be a material default of the Agreement and will be void. We may assign this Agreement to a third party at any time in our sole discretion. The Agreement will be binding upon and will inure to the benefit of the respective parties hereto, their respective successors in interest, legal representatives, heirs and assigns. You agree that if we do not exercise or enforce any legal right or remedy which is contained in these Terms or which we have the benefit of under any applicable law, this will not be taken to be a formal waiver of our rights and that those rights or remedies will still be available to us. Waivers must be in written form and signed by an authorized representative of the Company. All covenants, agreements, representations and warranties made in these Terms shall survive your acceptance of these Terms and the termination of our relationship. By providing us with your e-mail address, you agree to receive all required notices electronically, to that e-mail address. If you are a Clinician or Practice Group it is your responsibility to update or change that address, as appropriate. If you have any questions or comments regarding these Terms, or if you wish to withdraw your consent to these terms, please contact our head office by email at support@CarePaths.com or at the address first noted above. The eRecord is a fully integrated, online Cloud-Based, ONC certified, behavioral electronic health record and practice management system for psychiatrists, psychologists, social workers and mental health counselors.